Thiruvananthapuram, the Capital city of Kerala, is a clean and beautiful city, and a very popular tourist destination. It is built over seven low coastal hills. It is also recognized as an important gateway to the beautiful State of Kerala. This city got its name Thiruvananthapuram, literally means the “Holy City of Anantha”, the abode of the sacred thousand headed mythological serpent, Anantha. This enchanting city is lined with avenues, massive buildings, ancestral houses, ancient temples, long seacoast, palm groves and beautiful parks. This ancient city (11th century) was the spiritual centre of Travancore Kings, which became their capital in 1750. Today this capital city is blended with both traditional and modern facilities. Sri Padmanabha Swamy Temple – This temple is located near the entry bus station at the East Fort. It is a fine example of South and Dravidian architecture. The 18 feet shrine of Lord Vishnu as Sri Padmanabha Swamy is considered to be one of the most sacred Vaishnavite shrines. Here the shrine of Lord Vishnu is in reclining position on the sacred serpent “Sri Anantha”. Aakulam lake – This lake is 3 kms from Ulloor junction. The main attractions are boating facilities in the lake and the Children’s Park, which is one of the largest in the State. Chacha Nehru Children’s Museum – The children can enjoy seeing the rich collection of over 2000 dolls, stamps, masks and paintings here. 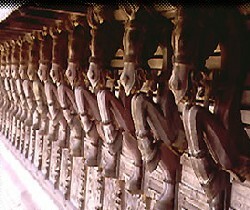 Napier Museum – This museum houses good collections of bronzes, historical ornaments, temple, chariots, ivory carvings and music instruments. Kuthiramalika (Puthen Malika) Palace Museum – Built in traditional Travancore style by Maharaja Swathi Thirunal Balarama Varma, this Museum provides a rare insight into the lives of Travancore royalty. C.V.N.Kalari Sangham – Training centre for teaching Kalaripayattu, an ancient martial tradition of Kerala is located in Thiruvananthapuram city. Also provides Kerala’s ayurvedic treatment. Veli Tourist Village – Located in the outskirts of the city, it is a picnic spot and waterfront park, with a wide range of aqua sports facilities. Zoological gardens – one of the oldest and best zoos in India, it is also regarded as the best laid out zoo in Asia. Kovalam Beach. located 16kms away from this city, is one of the finest beaches in the world. Kovalam is also famous for health and yoga centre. You can see many government approved Ayurveda centres here. Attukal Bhagavathy Temple : A temple famous for women and children, with Attukal Pongala festival. Other places of interests in this Kerala destination are Science & Technology Museum & Priyadarsini Planetarium, palm fringed Shanmugham Beach, Vettukad or "Madre de Deus” Church, and Beema Palli, an important Muslim pilgrim site. Vivanta by Taj in Kovalam. Ginger Hotel One of the best budget hotels. Keys Hotel Great Business Hotel with all amenities. Travancore Heritage Hotel Chowara hotel with a complimentary breakfast. Beach and Lake Ayurvedic Resort. at Pozhikkara Beach. Check out the best Hotels in Thiruvananthapuram.